Six months ago I began this blog as a way to answer the many questions we get from actors when preparing for their headshot sessions in Los Angeles. The idea was that when someone would call the studio with questions, we would be able to not only answer the question, but refer them to a more detailed answer online. Six months later, I’ve been very surprised by the response we’ve gotten. I guess the biggest surprise is how many people are finding the blog on their own and regularly reading it. We’ve had both return and new clients come to the studio letting us know they’ve read and prepared for their photoshoots using our blog and to my delight, those who have prepared have exceptional photoshoots. One of my recurring themes here is preparation. It’s truly the key to success in any endeavor (not just headshots)—I can’t stress this enough. My husband and I are avid foodies and travelers—we try to take a few trips every year with the hopes of seeing as much of our planet and experience as many cultures as we can during our lifetime. But because we both have a very busy work schedules, we absolutely must take time to prepare for our trips so that we can maximize our time abroad. First we talk with friends—and many times a friend’s recommendation points us to our next trip. Last year our studio’s post-production manager took a trip to Peru to visit Machu Picchu. His photos and experience from that trip inspired us to make the pilgrimage this year. Because I know Pablo’s aesthetic and trust his opinion, I knew that trip would be worth while and he was the first person I talked to when preparing for the trip. Next we reach out to friends on Facebook. We always receive some great recommendations for restaurants, local guides, hotels and more. Within a few hours our trip practically plans itself. The last step in the process is a visit to Amazon.com. We purchase a few travel books to learn up on some of the sites we’ll be seeing before we’re there. This way we aren’t depending on a guide to give us all the info we want, and I don’t have my nose in a book, when I could be looking at the wonders of Peru through the lens of my camera. In short, it doesn’t take much to prepare for a trip (or a photoshoot, or anything else in life), but the rewards of that preparation are staggering. With a little preparation, you’re no longer hoping for success, you're willing it. Maybe, if we are lucky, one day we’ll be able to retire in a way that affords us the luxury of living for extended periods in some of the favorite places we’ve visited. So in a way we are doing the legwork now for our retirement. Everything in life is preparation. So in turn preparation is everything. Jen Rudin—Confessions of a Casting Director: Jen Rudin is an award winning casting director. She’s cast animated films for Disney, Broadway shows, Feature Films and now she’s an accomplished writer. She’s witnessed first hand the entire spectrum of actor auditions—the auditions that were lighting rod moments to those cringe inducing auditions that inspired her to write her book. Her book is a great primer for anyone who is trying to make sense of this overwhelming industry. It demystifies the audition process and gives specific advice for actors audition for film, television, stage, and web series. Jen has a methodical approach to getting your game on, so you can succeed when the opportunity arises. You can buy her book here. 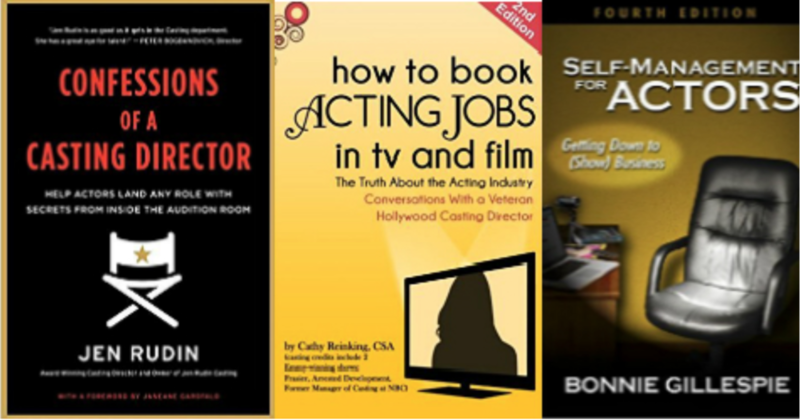 Cathy Reinking—How to Book Acting Jobs in Film and TV: Cathy Reinking is such a fan of actors and it shows in this wonderful resource. Her credits include casting for “Frasier,” “Arrested Development,” and former Manager of Casting at NBC. This book explores the audition process as well as being a primer for those just arriving to Los Angeles. One of the great topics in her book deals with charisma—that intangible spark that we all have that makes us unique and fascinating. She also has great tips for every level of actor regarding audition etiquette, agencies of note, and the differences in technique for stage, film and television. Cathy has a huge heart and it shows in this book. While you’re waiting to meet her in person, do yourself a favor and pick up her book here. Bonnie Gillespie—Self Management for Actors: Getting down to Show Business: Bonnie Gillespie is a huge advocate of actors both in and out of Los Angeles. Her book is like a college course in show business. She covers everything from actor branding, to agents and managers, to headshots and auditions, to what you should be spending your money on. It’s a valuable resource written in both an encouraging and professional tone and focuses on the business of show business. This book helps you bolster everything in your acting career that isn’t acting and helps put you in the driver’s seat of your own destiny. Pick it up here. Keith Ferrazzi—Never Eat Alone: Keith Ferrazzi literally wrote the book on networking. Because the entertainment industry is all about relationships, it’s important for actors to sharpen their networking skills. Every artist should know how to form relationships, follow up, and groom relationships in an authentic way. Successful acting careers are built on networks of professionals who know and champion your work as an artist. You’ll never be cast if they don’t know you exist. This book teaches you how to form relationships in meaningful ways and how to be remembered for the right reasons. Pick it up here. Just as you have taken time to better yourself as an actor, constantly working on your craft, it’s important to give equal time to learning the business of the business so you can turn your passion into critical and financial success. Start collecting these and other books into a library of resources that will keep you on track to a fulfilling career.